While preparing breakfast for my sons on Friday, June 8, 2018, a headline appeared on my phone and I was mortified. A tear shed, I couldn’t believe the news that the world was leaner by one – and not just any one. Inspiring, confident and humorous all come to mind when I think of the one and only, Anthony Bourdain. Not only was he a major influence on the culinary industry worldwide, but his approach and behaviour made Bourdain one of the most unique out there. As a passionate home cook and tv show host, Bourdain has driven my passion and creativity to say the least. I have consumed most of his books and TV shows and they truly are unique. Always a unique approach, serious tones and some dry humour. Just perfect in my opinion. From No Reservations to Parts Unknown and everything in between, Bourdain’s passion for food and education was evident. During my recent TV production, there was a not a day that passed that I didn’t think back to one of many episodes of No Reservations and how I could try to instill some of Bourdain’s techniques. 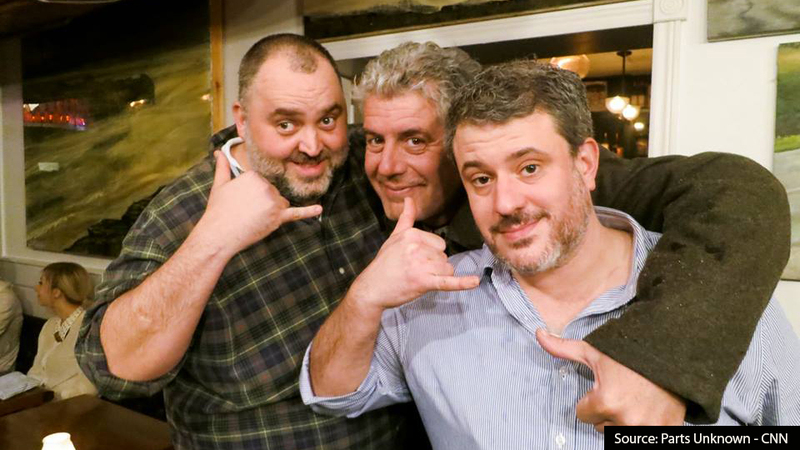 My greatest memory of all of his shows is by far the Montréal, Québec, Canada No Reservations episode and his visit to one of my favourite restaurants, Au pied de cochon. The glutenous meal prepared by none other than the wild Chef himself, Martin Picard, truly pleased my French-Canadian roots and the stomach of my eyes. But just a couple weeks back I enjoyed one of the latest Parts Unknown episodes featuring Newfoundland, Canada. Again, joined by some of my Chef friends and owners of Joe Beef, David McMillan and Frédéric Morin, he discovered the beauty of the province and some traditional dishes. In true Bourdain fashion, while enjoying a plate of Fish and Brewis, but most importantly the delicious Scruncheons – pork fat back that has been fried to a crisp. I would be remiss to say that his daemons were buried deep – I mean – he has come out numerous times speaking about them and his challenges. Mental health is real and his openness definitely helped make a difference to others who suffer as well. He has left his mark. Mad Radish is Tossing Salad up a Notch!